Many titles have been added to our forthcoming releases database, Incoming, this week, and many others have had additional information or links added to them. This includes Shameless - Series 5 (and the Series 1-5 box set); the Oscar-winning comedy Juno (available in single-disc and double-disc DVD editions, and on Blu-ray); National Treasure: Book of Secrets (on DVD and Blu-ray); high-concept science-fiction blockbuster Jumper (on single-disc or double-disc DVD and Blu-ray); BBC crime series The Chinese Detective; Casualty spin-off Holby Blue; and five's award-winning comedy series Californication. Thanks again to the Incoming team: Barry, Ben, Ceri and Graves for updating the database. The DVD of George Franju's horror masterpieces Eyes Without a Face (Les Yeux Sans Visage) has been delayed: it will now be released on May the 12th, three weeks later than originally announced. If you read our review of the first series, you'll know that the series is being released on DVD as very much a labour of love, and independently licensed from the BBC. If anything, the new disc is more impressive than the first, with a solid collection of bonus material (including commentary tracks on every episode and the show's Comic Asides pilot episode in full). The episodes have been meticulously restored (a process that is examined in some detail here). Most months FSM releases two titles: a Silver Age Classics release and a Golden Age Classics release. These are categorised by the age (and, to a degree, the perceived target market) of the scores in question. Golden Age scores date from to 1960; Silver Age scores date from 1960 onwards (their most recent release, David Shire's Monkey Shines, dates from 1988). 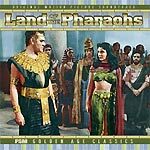 The most recent Golden Age Classic to arrive at Zeta Minor Mansions is a two-disc set featuring Dimitri Tiomkin's lavish score for Howard Hawks' camp 1955 Cinemascope epic Land of the Pharaohs. Tiomkin, fresh from his Oscar success for The High and the Mighty, was given a generous budget for the film, and composed a full-blooded, richly-thematic score for an orchestra of more than ninety musicians and a choir of eighty. Just recording the score took almost six months! Unsurprisingly, the resultant score accompanies almost the entire film. FSM's discs reflect this, offering several chunky suites comprised of several cues. The score is almost two hours long, with another ten minutes of additional and alternate cues tagged onto the end of disc two (including a pop instrumental version of the main theme, which was recorded for release as a single). FSM's CD offers the complete score, and this is the original recording's (legitimate) CD debut. Ignoring a few poor-quality bootlegs, Elmer Bernstein re-recorded some material in 1978, with a much-reduced orchestra, for his Film Music Collection series (which is also available from FSM). A couple of re-recorded Land of the Pharaohs cues have also popped up here and there on compilation albums. It almost goes without saying than none of the bootleg recordings offers sound quality approaching the FSM disc, but it should be noted that without exception they lack vital elements which make some key cues, (the technically-ambitious Song of the Builders, for example), incomplete. Land of the Pharaoh's stereo master tapes were long-ago archived to mono, but the survival of some separate elements (overdubs, solos, etc) has enabled FSM to offer some of the score in stereo. 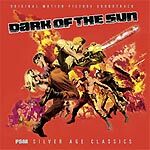 FSM's Silver Age Classic is Jacques Loussier's score for Jack Cardiff's 1968 action film Dark of the Sun (which is perhaps better known outside the US as The Mercenaries). The film, a Heart of Darkness-style pot-boiler set in 1964, in war-torn Congo, reunited The Time Machine's Rod Taylor (in butch mercenary mode) and Yvette Mimieux (playing a French refugee). Although the film boasted some exotic location filming (shot by former cinematographer Cardiff, and DoP Edward Scaife), with Jamaica standing in for Africa, the film was actually a British production, based at MGM's studios in Borehamwood. The film's score was written by Jacques Loussier, a name that will be unfamiliar to most soundtrack fans. He's better known to jazz aficionados, for his series of Play Bach albums (which sold a staggering six million copies in the 60s and early 70s). He also composed the music for a landmark French television series, Thierry la Fronde, and the LP from the series sold a million copies. Dark of the Sun's raw, brassy, multi-layered score, which might reasonably be classed as avant-garde, was afforded a much larger orchestra than Loussier was used to, comprised of about sixty to seventy musicians. About half an hour of the score has been released on CD before (by Chapter III), but the disc was mono, and many cues were offered in abbreviated versions. Four tracks were subsequently included on a French compilation disc, Les Plus Belles Musiques de Jacques Loussier. This new disc features almost the entire score (one cue is lost), running for about an hour. Ten minutes of alternate cues and versions from the 1968 album release are also offered. FSM's disc is in stereo, taken from quarter-inch stereo archive tapes. Both discs come with FSM's customary cue-by-cue track and background notes (the Dark of the Sun booklet includes the track notes from the original MGM album, and shows how it can be re-created using the new CD, incidentally). Both CDs are limited edition pressings of 3000 copies. They're available from specialist etailers, notably FSM's trading partner, Screen Archives Entertainment.